A firm which has been producing swords for 150 years is shutting its west London factory and ending a long partnership with the Army. Wilkinson Sword is closing its Acton factory, staffed by 14 craftsmen, because of falling demand. Although it shifted focus back to producing razors after World War II, it continued to supply the Household Cavalry with ceremonial steel swords. 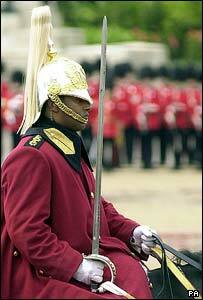 The Army needs a new supplier but says there is no immediate sword shortage. A spokeswoman for the Ministry of Defence said: "It is more important that we find the best supplier for the job than how long that takes." Wilkinson Sword said five of the 14 craftsmen at the factory will stay on for a while and three have already found other jobs. It is trying to help the others find other employment. Wilkinson, founded by gun maker Henry Nock in 1772, became George III's Royal Gun Maker and was supplying the British Army with guns and weapons like bayonets long before it started making swords in 1854. It began making razors, for which it is now best known, in the 1890s, but was drawn back into weapons production during World War I and II. By the 1940s it was again producing mostly razors and garden tools, but continued to supply ceremonial swords, worth up to £1,000 each, from Acton. The Acton factory dedicated itself in 1953 to making swords and accessories to fit out hundreds of soldiers from across the Commonwealth. It also produced a special sword for the Silver and Golden Jubilees and has been supplying the Household Cavalry with 50 to 70 swords a year. Major Mike Alcock, responsible for procurement for the Cavalry, said: "The Wilkinson Sword blade cannot be copied. "I think everyone is sad. We have had a professional relationship with Wilkinson Sword for centuries."